Gold in Gold watermelons are medium to large in size and have an elongated oval shape. The thick, strong rind is yellow with mottled gold stripes. The bright golden-yellow flesh is crisp, very juicy and contains small, tear-drop shaped black seeds. Gold in Gold watermelons are very sweet with a higher sugar content than the red-fleshed varieties. At full maturity, the melons can weigh anywhere from 11 to 16 pounds. Gold in Gold watermelons are available in the late summer and early fall months. 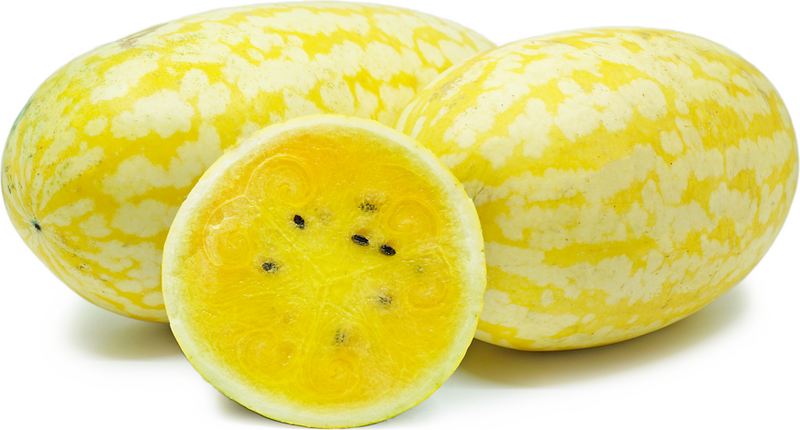 Gold in Gold watermelons are a hybrid species, botanically classified as Citrullus lanatus. The large melons were named for their golden-striped skin and gold-hued flesh. 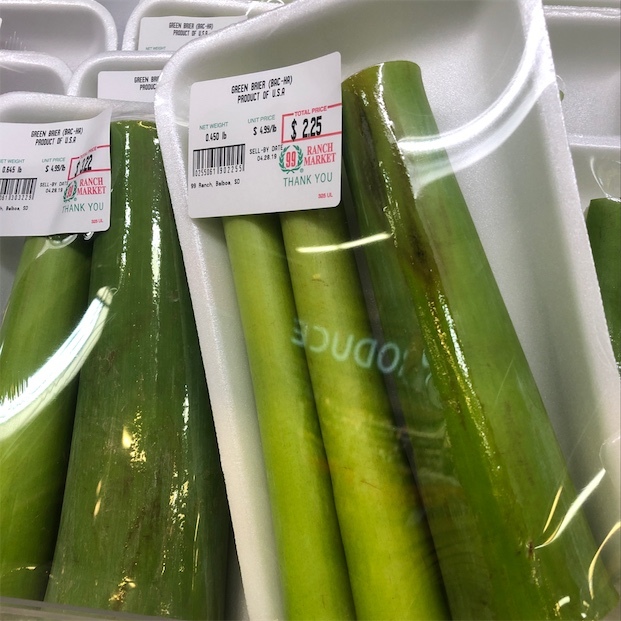 They were declared the All-America Selections Edible-Vegetable Winner in 2017 for their flavor, yield and disease-resistance. Gold in Gold watermelons are a good source of vitamins A and C, as well as potassium and the antioxidant beta-carotene. The melons are high in carbohydrates, mostly in the form of sugars, and contain around 90 percent water. They are a good source of dietary fiber and contain small amounts of protein. Gold in Gold watermelons are ideal for fresh eating and can be substituted for any variety of watermelon. Pair seeded, diced melon with bitter greens, feta or goat cheese, burrata, tomatoes, olive oil, cucumber, or citrus. Sear or grill plain or marinated slices of Gold in Gold watermelon and serve alongside meat or fish. Pickle the melon, with or without the golden-yellow flesh, in a brine of vinegar, salt, chiles and other spices. Juice the pulp for beverages, cold soups, vinaigrettes, ice creams and other cold desserts. Uncut Gold in Gold watermelons can be stored at room temperature for up to a week. For longer storage, refrigerate for up to a month. Unlike most other varieties of watermelon that produce at least 2 to 4 melons per plant, Gold in Gold watermelons only produce one fruit per vine. Gold in Gold watermelon were developed by the Asia Seed Company in Korea. It was released to the market in 2017 and is available through select online seed vendors. The new melon variety pictured was grown by Chino Farms in San Diego County during the 2018 season.